Nestled in the heart of Yorkshire, Harrogate is the ideal place to go for a weekend of relaxation, or an afternoon of retail therapy. This picturesque spa town was popular among Edwardian and Victorian high society and has continued to be a top tourist spot ever since. I recently visited the town for a couple of days, so thought I'd share my best finds with you. Harrogate is the perfect base if you're hopping around the Yorkshire dales. Meanwhile, the plethora of restaurants, shops and beautiful green spaces mean that you could spend a few days exploring the town itself. Harrogate town centre is full of high street shops and independent boutiques. It's great for a girly afternoon of retail therapy. Visit James Street and Cambridge Street for familiar brands such as Topshop, Lush and Next. Alternatively, head to the Montpellier Quarter for an array of unique fashion, gifts and antiques. Harrogate is where the story of the famous Bettys Tearooms began, so it'd be rude not to have a cuppa. The first Bettys opened in the fashionable spa town in 1919 and has been a huge success ever since. Not only can you sit down and indulge in delicious treats, but you can also take something sweet home with you at the neighbouring delicatessen. Otherwise, head down Montpellier Hill towards Jenny's Tea Shop. This vintage-inspired cafe is a more affordable choice and located in a quaint courtyard. Get a whiff at The Royal Pump Room. The Royal Pump Room Museum is set in the old Pump Room and features displays of the town's history, including an ancient Egypt section. Although a bit of a mismatch of collections, the Pump Room building itself is simply stunning. Don't be offended by the slight pong as you enter, however. That's just the scent of the sulphur wells that the town is famous for. Another must-do is to try some Original Harrogate Toffee. Established in 1840, Farrah's of Harrogate, designed the sweet treat to cleanse the palate of the putrid taste Harrogate's 'healing' Sulphur Water. Nowaday's the toffee is famous worldwide (and delicious too). Unwind in the stunning gardens. You can really tell that Harrogate was a place for recuperation and healing from the beautifully-kept gardens dotted around the town and surrounding areas. We visited the Valley Gardens, which also feature a number of mineral springs. I personally love wandering around gardens. Since moving to Hull, I rarely get to see that much greenery and so I find the experience really relaxing and therapeutic. Nearby, there's also The Stray, a spacious parkland and RHS Garden Harlow Carr, a vibrant horticultural garden. Just a ten-minute drive away from Harrogate is Knaresborough. We stumbled upon this charming market town on our way home. 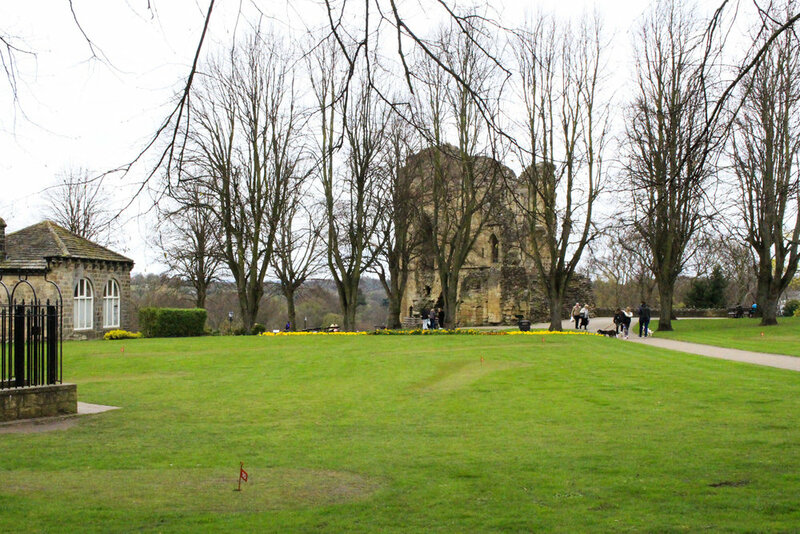 The ruined castle is a must-see and overlooks the gorgeous River Nidd. A train passing through the green hills across the river on the viaduct is a particularly charming British scene! In the meantime, the town is full of medieval streets, independent shops and pubs, so it's certainly worth spending an hour or so exploring. Be sure to pop into England's oldest chemist and say hello to Blind Jack, the famous blind roadbuilder from the 1700s. Just up the road is the magical Mother Shipton's Cave. Open since 1630, it's England's oldest visitor attraction. For just £7, you can learn about the intriguing prophetess who predicted the invention of iron ships, the Great Fire of London and the defeat of the Spanish Armada. Although we ran out of time and didn't end up visiting the cave and petrifying well, it's definitely something that we'll do another time. Have you ever been to Harrogate? Where else would you recommend in Yorkshire?